This is the view from the bus to Nantou after waiting two and a half hours the day before the Tomb Sweeping Day holiday. It took me about 10 minutes just to find the back of the line I was supposed to be in. 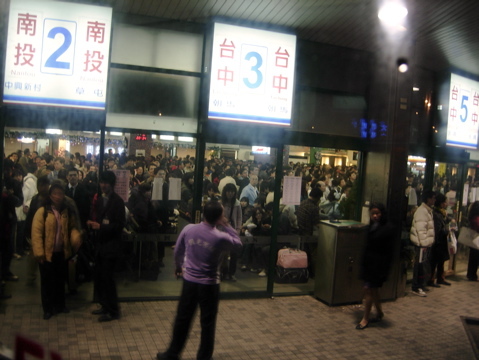 The lines to Taichung went out the door and down the stairs leading to the Station Underground Mall. I couldn’t grab any pictures from inside the station because I feared that if I took off my backpack I might accidentally knock over no less than a half dozen people in the process.